Overcome fear of riding horses with these helpful tips I’ve used a time or two! How do you bounce back after a bad fall? I’ve seen countless equestrians fearlessly hop back on after a death defying fall, leaving me to feel like a wimp at best as I stare up at my stirrups in defeat. I don’t want a broken back, a dislocated hip, or another year of tailbone pain (which just recently dissipated after my last fall). The body uses fear as a protective measure against danger, so some level of fear is healthy when you’re hanging around animals that weigh over 1,000 pounds. But constant fear is only going to get you in trouble. Horses can sense fear with the same clarity you’d would see a horrifying clown covered in blood, carrying an axe and running straight for you. So, when you’re afraid, your horse is even more afraid. 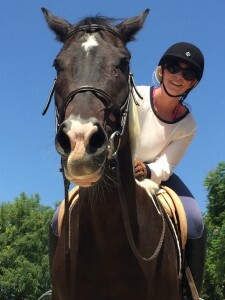 I consider myself a pretty brave equestrian in the sense I feel safest surrounded by horses, but that doesn’t mean I don’t experience periods of fear or trepidation—of course I do! We’ve all been in the same pair of shaky boots before, so what’s the difference between used-to-be equestrians and us lifelong horse people? We love it too much to let anything, including fear, get in the way. You Can Overcome Your Fear of Riding Horses! If you want to be around horses and overcome your fear of riding, the following tips can help. I still remember one of my first trainers yelling at us, “Get back on your horse!” It didn’t matter if we were bruised up, bleeding or crying, she was going to make us get back on and do it again. To this day, I always get back on after I fall off. Unless you are injured or it is too dangerous, get back on your horse right after you fall off. Waiting to get back on another day lets your mind think too much and could give you more anxiety about doing so. Watching someone else enjoy riding your horse, or a horse you plan to ride, can help ease your mind. From one horse-lover to another, how can you resist the urge to ride after watching someone else ride? As you start wanting to ride, the fear of ‘what-ifs’ begins to fade away. Additionally, having someone else ride a horse first may help calm him down so he’s more relaxed and lazy when you get on. Have that same friend stick around while you get back in the saddle. Their support and guidance can make a big difference, especially if they know a lot about horses and are a confident rider. If you ride horses, you are going to fall. Instead of worrying about it, plan for it! Your helmet is there to protect your noggin, and a jump vest can protect your vital organs and some of your bones—including your spine. It may take some getting used-to but it’s worth it if you fall off, as well as for peace of mind. I recommend trying on different types of vests to find one you feel most comfortable in. 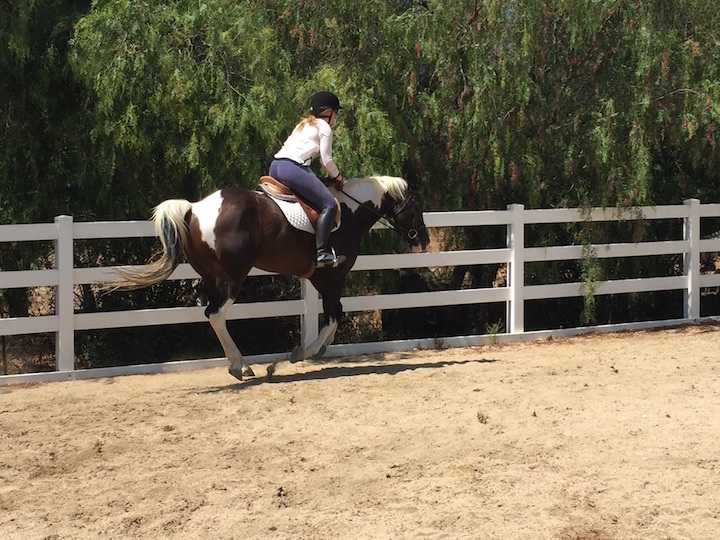 Riding a different horse that is very well mannered and easy to ride can help build confidence and remind your fear-ridden brain that you do, in fact, know how to ride a horse. 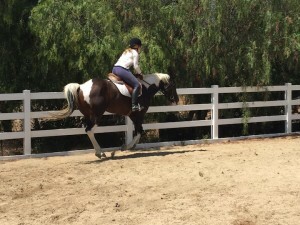 If you don’t have any pushbutton horses available to you, enlist in riding lessons at a local stable to regain your confidence on one of their lesson horses. When you set up your lesson, explain your purpose in going there so the trainer can match you with a good horse. 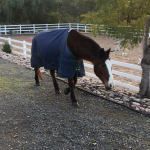 Maybe you fell off jumping, or your horse tends to buck and catapulted you outta your saddle, no matter what you are nervous about your horse doing, take the time to write it down. Write out the whole incident in detail to help you uncover triggers for the action, and things you could do to prevent it from happening in the future. Reassure yourself that you know how to handle it by writing down how you’ll react the next time it happens. If you are not currently working with a trainer, find a trusted trainer with good reviews to help assist you getting back in the saddle. One-on-one assistance from a professional can offer invaluable advice that’ll keep you safe and teach you how to prevent, respond to and correct your horse’s bad behavior. Horses often act up because of rider error. A trainer can help pinpoint and correct things you might unknowingly be doing that negatively interfere with your horse and result in bad behavior. Next Up: Falling Off a Horse: What Does it Feel Like? Hello! 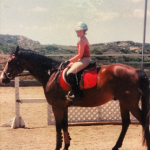 I am a horseback riding writer from sunny San Diego, California.